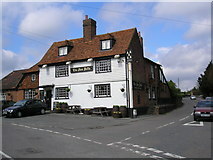 The pub is in two separate areas which are not connected internally for customers. Food is served in the salon bar. Lunches are served all week noon-3pm. There are two sittings for sunday lunch at 1pm and 3:15pm. The evening restaurant is open Thursday, Friday, Saturday 6:30pm-9:15pm. The evening menu changes weekly. They also do takeaway fish and chips. bob visited on a Saturday lunchtime and had roasted pheasant with braised cabbage and fondant potato (£9.50) photo. This was fine. In my opinion it was a touch overcooked but not in a bad way. I suspect the chef was playing safe. For dessert I had toffee and honeycomb pie (£3.95) photo. This was fine, though certainly full of sugar; the "pastry" had cocoa powder in it. The beer was very good. I had a half of Cottage Brewery Full Steam Ahead (£1.50) and a half of Harvey's Sussex Best (£1.50). The other beers available were Courage Best, Doom Bar and Cornish Knocker. Accessibility: Both entrances have several steps. The public bar is level. The salon bar is on two levels joined by a sharpish ramp. No steps to the gents in the salon bar. Last visited by bob, 8 November 2008. Food times taken from that visit. Opening hours taken from the 2009 Good Beer Guide. Last edited 2017-09-15 17:28:25 (version 19; diff). List all versions. Page last edited 2017-09-15 17:28:25 (version 19).